This entry was posted in Environment, Food, Music, Permaculture, Random and tagged Electro Swing, Formidable Vegetable Sound System, Gypsy Fingerz, Mal Webb, Music, Permaculture, Seed Swap, Sunshine Coast, The Shared, Yandina. Bookmark the permalink. Hey Tarna, Hope you is all good and keeping warm at la shrubb. Did you know that shrubb is an old drink? maybe that’s what the farm is named after? 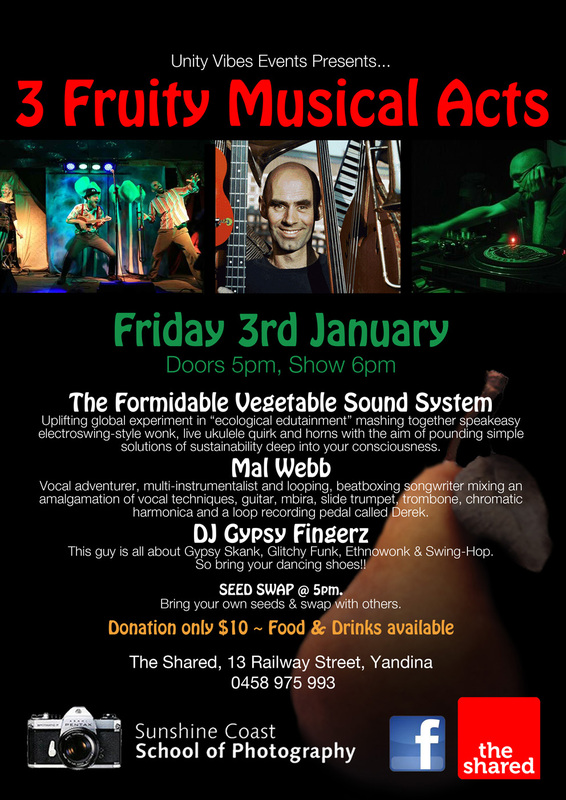 Well I’m not the veggy sound system no, I’m Gypsy Fingerz. The Veg Sound System guys are wicked tho!! First gig in Oz. Should be a laf!